In September 2012 Kelly and I travelled to Indonesia to do some diving on a liveaboard (MV Mermaid II) and then another week's diving at Tulamben. We went back again in 2014 for almost three weeks. The following information is provided to assist people in planning a diving trip to this great location. To see the dives available here, click on this link. Tulamben is a very small town/village located on the north-eastern coast of the island of Bali, Indonesia. For most people, Bali is considered an exotic location, made famous in the 1952 movie Road to Bali, the sixth Road movie starring Bing Crosby, Bob Hope and Dorothy Lamour. For many Australians, Bali is the location of their first ever overseas holiday and is the second most visited country by Australians. Of course, in more recent years, the Bali Bombings, especially the first one in October 2002 when 88 Australians were murdered and 202 in total killed, have brought this tropical location to the attention of the whole world. Tulamben is generally only visited by scuba divers as there is not a great deal for non-divers to do here that cannot be done in places closer to the main tourist resort areas of Denpasar and Kuta. The diving in this area is excellent, as good as any location anywhere in the world. Read about the diving using the link in the first paragraph. From Australia, Virigin Australia, Jetstar, Garuda and Qantas fly almost daily from most capital cities to Denpasar, Bali. Qantas flights actually use Jetstar for the final leg into Bali and the direct flights from main cities. From Sydney and Melbourne, there are direct flights from the first three airlines. There are also direct flights from Perth, Brisbane and Darwin. From Sydney, the best options are Virgin Australia with a midday direct flight and Jetstar with a late afternoon direct flight. You can get very cheap flights at times, but these probably coincide with the wet period which is certainly not the time to go diving in Tulamben (see weather later). You will need to book extra luggage to take your dive gear, I would recommend the 25 kg limit as this is more than enough to take all your gear, camera and clothes. It is about a 6 to 7 hour flight from the east coast. The main flights arrive in Denpasar about 10 to 11 pm, although the Virgin flights seem to get there at 4 pm or so (all these times depend on whether daylight saving is operating). The Jetstar return flights leave about an hour after they arrives, although the Virgin ones do not go till late evening or even very early the next morning (the plane may be a different one to the flight over). There are also flights to Denpasar from the major Asian cities. Denpasar has a new airport in 2014, it is much nicer than the old one. You need a visa to enter Indonesia. You can get from the Indonesian consulate/embassy in your home country, but the easiest way is to get it as you enter the country. The cost is US$35, AUS$42 (was US$25, AUS$26 in 2012 - a huge increase) or a similar amount in rupiah, Euro etc. The exchange rate is strange, so in 2012 I paid in US$ which we had left over from our US trip as this was cheaper. However, in 2014 when I went to use US$, they would not accept the US$100 I offered as it was "too old". The AUS$ prices was considerably more than the correct exchange rate. Once you have paid your VOA (Visa on Arrival) fee (which is very quick), you need to pass through immigration. There were 6 to 8 lines but it was a slow process. In 2012 the officer working on our line was busy talking on her mobile phone the whole time she was processing arrivals, although I must say she was as quick as any other person. Hard to see how she could do a good job though. In 2012 there were people in this area (amazingly) who seem to offer a service to by-pass this queue, but as I detest having to pay for something that is free and also as I worry about the possible legality of this, I would not use these people. This did not seem to be available in 2014. It was so slow getting through immigration that all our bags were waiting on the floor next to the carousel when we finally got through. Once you collect your bag, you pass through customs and all bags are x-rayed. Of course, there is a death sentence if you smuggle hard drugs and even soft drugs will put you into gaol for 20 plus years, so it is not even worth thinking about this. This process was simple and quick. Once out of customs you walk past a taxi desk where you can get slip with the right price for a cab to your hotel. 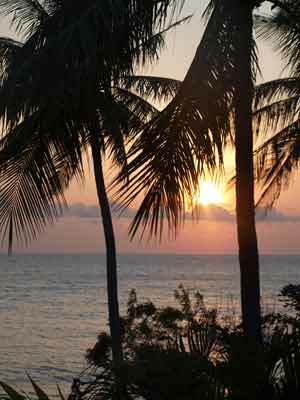 As mentioned, Tulamben is located on the north-eastern coastline of Bali. It is about 90 kilometres from Denpasar and Kuta to Tulamben. This is at least a three hour car trip, more likely three and a half hours. 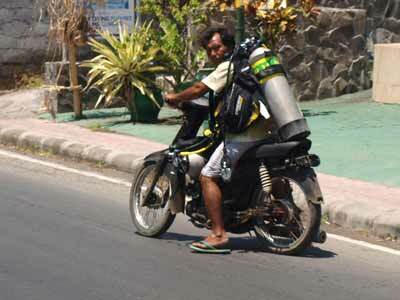 Most of the dive operators in Tulamben will arrange pickups from the airport or hotel for a very reasonable price. If arriving on the Jetstar flights, you may want to stay overnight in a hotel and travel the next day as you would not arrive in Tulamben till 2 am or later. If you go in daytime, you will get to have a nice sightseeing trip on the way. There is a lot of interesting things to see, including rice paddy fields, volcanoes, temples and more. Indonesia uses the rupiah as its currency. There are approximately 10,000 rupiah to the Australian dollar (and a similar amount to the US dollar). You can swap money at the airport. When we went in 2012 the rate was 9,200 rp to the US dollar and 9,500 to the Aussie dollar. ATM machines give a much better rate, but you will get hit with charges. In 2014 there did not appear to be any banks or money changers at the airport (dozens in 2012) so you will need to change elsewhere or withdraw a large amount from an ATM. If travelling to Tulamben, there are now two ATMs there. The one on the ocean side of the street has a maximum of 500,000 rp but the one on the other side lets you withdraw 2,000,000 rp. Use this one as you will need to withdraw at least 2,000,000 rp a person a week for expenses you cannot charge to a credit card (local restaurants, supermarket, tips etc). I think that the breakeven point for withdrawing from an account versus changing is probably about 2,000,000 rp. If you withdraw more, then you will save money. What a shambles! As you exit the airport you will be accosted by hundreds (and I really do mean hundreds) of taxi drivers trying to get you to go with them. Do not, under any circumstances, let someone help you with your bags unless you are prepared to use their taxi. Before you do this, agree on a price. Do not get to their car and then try to agree. Better still, go to the taxi desk as you leave the immigration section. If you do an internet search you will find a web site for the airport that lists the Government set price for a trip to most popular locations. For example, the price to our location should have been 100,500 rp (AUS$10.50) but one driver wanted 200,000 rp. We ended up getting a taxi for AUS$15. To get the proper price, apparently there is a desk to the left as you come out and you go there and pay or perhaps get a voucher. Probably the best thing to do is prearrange a driver via the internet. There are a number of companies doing this and the price is correct and you do not have to put up with the hassling as the driver will be waiting for you with a sign. I certainly would not consider hiring a car, the traffic, even at midnight, is horrendous and chaotic. As far as I could see, there are no buses that can be hired (we had 13 people in our group and we tried to see if we could get one to travel to our hotel but could not, so we had to use four taxis). Tulamben is probably more a village than a town. It is a one street town, with the main highway passing through it. There are a couple of laneways that run down to the water, but they only lead to hotels or the beach. There are numerous hotels, dive shops and restaurants (more about these later) as well as a single supermarket and a gift type shop. There are now two ATMs as I mentioned above. That is about it. 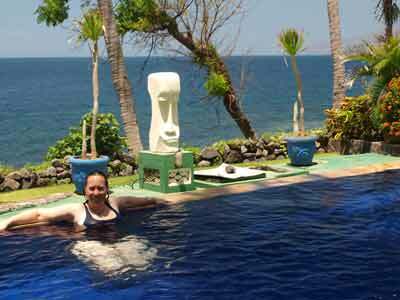 There are probably a dozen different accommodation options in Tulamben. We used Tulamben Wreck Divers which has three different accommodations. There are also Mata Hari, Paradise, Tauch Terminal, Liberty Divers and more. Do an internet search and you will find most I suspect. Of these, Paradise was very basic but looked okay (two of our friends stayed there), Mata Hari was a bit nicer and Tauch Terminal even better. There was also another more upmarket place south of these called Mempi. As mentioned, we stayed at Tulamben Wreck Divers. They have accommodation behind the dive shop, another place a few buildings down the street and another place just out of town overlooking the water. All the accommodation was excellent, with the pick being the beachfront villas (where Kelly and I stayed) and then the penthouse suites. Even the cheaper accommodation was very nice. All had swimming pools, your own bathroom as well as plenty of space for gear. The dive shop is the second closest accommodation to the main dive site of the USAT Liberty. Each room has a fridge, kettle and tea making facilities. They provide a bottle of water for making tea but charge for any more that you use out of the fridge. There are a few powerpoints, European twin round prongs. If you have a few cameras or torches, you should take a powerboard as well as your adapter. Accommodation at Tulamben Wreck Divers also includes breakfast. This included cereal, juice (freshly pulped), bacon, egg, sausage, tomato, toast tea/coffee. It was quite nice, especially at our place looking over the water. Once a week they have a Bali feast. This is held at our villas. For about 90,000 rp (AUS$9) you get a great smorgasbord meal, at least three courses, tea/coffee etc. They also have beer and soft drinks for sale at cheap prices. The only downside to our accommodation at the beachfront villas was that it was about 800 metres from the dive shop. However, we were given (as part of the deal) a scooter to transport ourselves back and forward. Although this would have been a bit harder to take cameras etc, we left our torches and camera housings in one of our friend's room and just took batteries and cameras (and computers) back and forth from the villas as needed. We actually carried our torches and cameras on the scooter in 2014 without problems. I should mention that the scooter was an easy option (I have had a bike licence for over 40 years), and although the driving styles of the Balinese is crazy, we only had to drive on the main road for 500 metres or so. The main thing where care needed to be taken was when leaving the main road and crossing across the other traffic lane to ensure that a faster vehicle did not try to overtake you. There is a very small supermarket almost opposite the Tulamben Wreck Divers shop. This sells soft drinks, beer, biscuits, chips and nuts etc. It also sells more substantial items. The local beer is Bintang. It is allegedly a pilsner, but I doubt it. It is a reasonable beer, but nothing special. It is drinkable. Cost was 18,000 rp for a small can/bottle and 28,000 rp for a large bottle. There are some other beers, including imported stuff, but the Bintang is as good as them and cheaper. Soft drinks are 8,000 rp a can (Coke, Diet Coke, Schweppes including Tonic) and chips and nuts are cheaper than back home. There are also small and large bottles of drinking water. We purchased a few beers to have before going to dinner as well as afterwards. There are numerous places to eat in Tulamben. The place we ended up eating most of our lunches was the Tulamben Wreck Divers restaurant just a few doors down from the shop. This was not only convenient, it was cheap and good. We tried a lot of different dishes and only one person had one that was perhaps not as good as it should have been. The pizza was really nice. Best thing is to see what someone else is having and ask them what it is. We also ate lunch once at Wayan's opposite the dive shop, okay, but a bit slow. Most of the restaurants change almost identical prices and, in fact, appear to have almost identical menus. For dinners, we ate at a few more places. As well as Tulamben Wreck Divers (which again was cheap and good), we tried Mata Hari a few times. I had a really excellent and hot Nasi Goring. The food here was cheaper that some of the other places that look over the water. We also ate at the Tauche Terminal (aimed mostly at Germans) and had a good meal, but it was 50% more expensive, especially drinks (gin was double the price of other places). We also had drinks at Paradise and Safety Stop. Some ate at these places and reported a nice meal. The one place that failed was Sandya's Retaurant which some of our group tried. They reported it was slow and the food not good. In 2014 we ate at Narung Kamang in the main street, two meals and two large beers was 150,000 rp. As mentioned there are many dive shops/operators in the town. Most are connected to accommodation, but some appear to be independent. 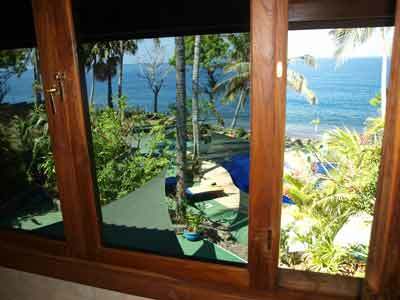 We used Tulamben Wreck Divers as we had a package deal including accommodation. Despite it being a bit of an apparent shambles when we arrived, it was a well managed operation that was very accommodating to our needs. The base cost of dives was about US$33 each, but you can get unlimited dives each day for US$115. 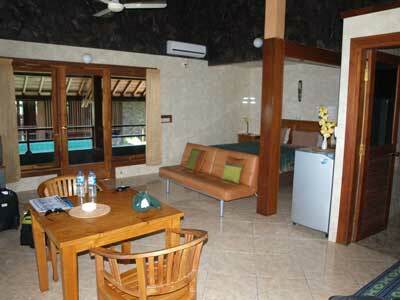 They also organise transfers from the airport/Kuta for US$45 each way. 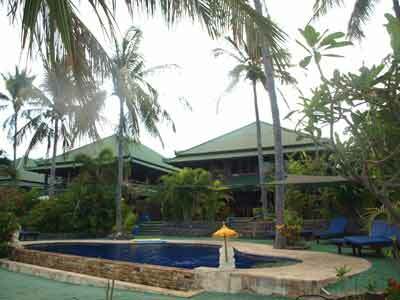 There are also packages of 7 days accommodation, 14 dives, breakfast and transfers for US$625. This works out at less than US$25 a dive. If you organise a group you can get additional discounts. Kelly and I decided to do three dives a day, but some in our group did four. Three was relaxing for us and gave us time to write up dives and read etc. Most of the operators work similar, but this is how Tulamben Wreck Divers do it. When you come to the dive shop, your gear will be ready waiting for you already set up. The tank and BCD are transported to the dive site, either by motorcycle (one on the rider's back and the other between his legs) or carried on the top of a lady's head (two in fact). You just put on your wetsuit and weight belt and then carrying your fins, mask and camera, you walk to the site. The most famous, the wreck of the USAT Liberty, is only two minutes walk at the most. The furthest of the sites is about five minutes walk. Some other sites are accessed by ute. These are about three kilometres away. A couple of dives are done by small boats and these leave from next to the wreck. Once at the site, you gear up and walk into the water. When back after the dive, you leave your gear on the beach and it appears back at the dive shop. You just need to walk back and then wash your camera, wet suit etc and then head back to your room. The gear is then ready again when you come for your next dive. Guides are provided for dives, but you do not need to use them if you do not want to. However, I would suggest that you should use them for most of your dives as they will show you where all the incredible creatures are to be found. We would certainly never have seen as much as we did if we did not use a guide. We did perhaps three dives without a guide, all of which were dives at sites we had already done at least once. It is wise to do the wreck of the Liberty early as the hordes of divers from Kuta arrive about 8:30 am and you do not want to be in the water then. They generally do three dives, so it is not clear again till after 3 or 4 pm. We mostly dived there at 6:30 am and then again in the late afternoon. It was nice to go back to the resort after this early dive and have breakfast. You can arrange tours with your accommodation, dive shop or probably even just walking along the street. A nice all day tour is to the water temple (you could do this on the way back to Denpasar) and the Mother Temple as well as other things like coffee farms and the volcano lake. We did both these on our last day and worked out a price which gave us credit for the money we had already paid to get back to the airport. One thing, if you visit the Mother Temple, take some long pants. Otherwise, you will need to purchase a sarong to cover your legs. This applies to males and females. An excellent holiday. I could have easily spent a couple of weeks diving here (we did three weeks two years later). The all up cost of the week was about AUS$800 each (plus airfares) for about 15 dives, accommodation, meals and drinks. Remember, we were staying in the most expensive accommodation, so even staying at Tulamben Wreck Divers you could do it for at least $200 cheaper.